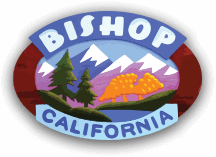 If you are traveling the iconic US Highway 395 through the Eastern Sierra then you owe it to yourself to take an extended break in Bishop. Or, perhaps you’re looking for a great place where you can escape for a couple days and get out of the city and into the mountains. Come to Bishop. Come play in our big backyard. 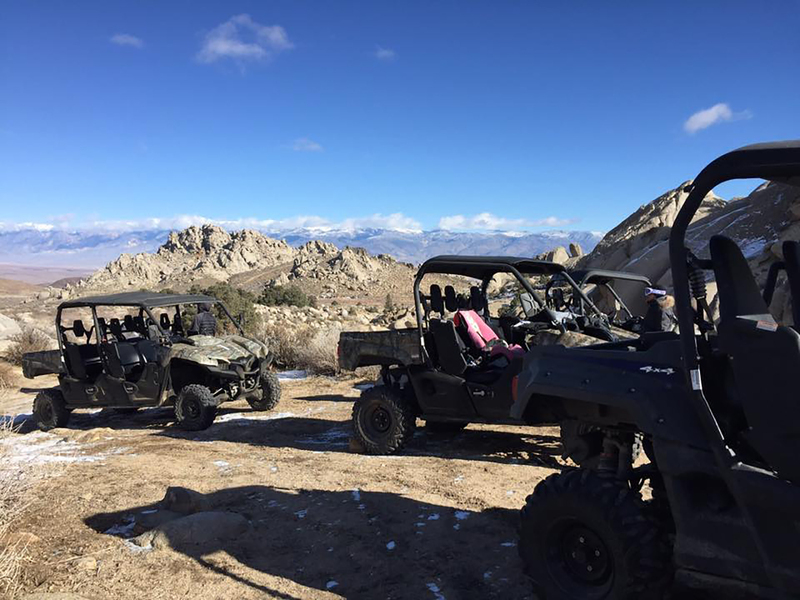 Our beautiful big backyard has so much to offer that we want to share a suggested itinerary for auto & OHV touring in 48-hours in Bishop in winter! If that’s something you’ve never contemplated, or thought possible, then take a look at this. The drive from southern California is anywhere from 4 to 6 hours, depending on your starting point. So, beat your early morning traffic jam and get yourself and your friends and/or family to Bishop by noon. Take a look at this great Bishop vacation guide. You could also request a printed guide to be mailed to you. Keep it with you as a handy reference. Click on each day’s itinerary for a full rundown on where to stay, and what to see, do and eat! Central. Convenient. Affordable. Kids & Pets Stay Free! Aaron Schat’s Roadhouse on Main St.
You’ve probably arrived hungry! In fact, we suggest you arrive hungry. We call Bishop the ‘small town with a big backyard’ — and we also have a pretty impressive kitchen go with it. There are many great food options here and we’re going to send you off to a whole bunch of them while you’re here. Today, start out at Aaron Schat’s Roadhouse. This large family friendly restaurant serves great burgers and sandwiches with super sides. Try the rotisserie chicken, BBQ ribs or excellent steaks, or a combo. There are delicious salads and vegetarian options too and yummy choices for kids. It’ll be warm and comfy in the spacious interior, but eat up and grab some bottled water and sodas for a very special afternoon drive. Note that the Roadhouse is closed on Wednesdays. Did you marvel at the magnificent views on the way here? The broad, arid valley and majestic, snow covered mountain ranges that rise up on either side are incredibly beautiful and impressive. The scenery is evocative of the old west and the hardships endured by the pioneers who first encountered this ancient landscape. The old rocks and trails safeguard the history of an adventurous people. The stories they might tell can only be imagined. Begin your 48 hours of adventure with an easy 12-mile (out and back) drive on a well graded dirt road. It is accessed 20-miles north of Bishop off US Highway 6. The road will take you through a rugged little canyon where eons of weathering of the rock, known as Bishop Tuff, was carved by wind and water. The elements gouged and fractured the soft rock scouring deep pockets and cutting arches through it. It was also hammered and dug by miners over 100 years ago. 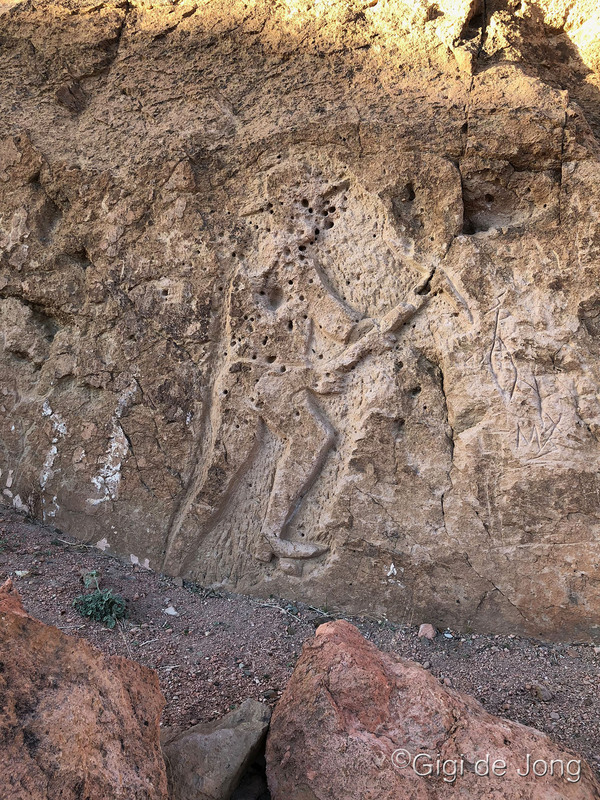 Look for the petrified reminder of the souls who ventured their livelihoods and lives in the pursuit of gold and glory in this forbidding landscape. He’s only known to us as “the headless miner” and he is forever etched into the rock face of this canyon. When you find him, pull over and step outside your vehicle and imagine the life and times of those who ventured here over 100 years ago. Safeguard this history. Take only pictures and walk carefully alongside the legacy of others. Turn around and head back the way you came. The sweeping vistas from this side of the valley are magical in the light of the setting sun. 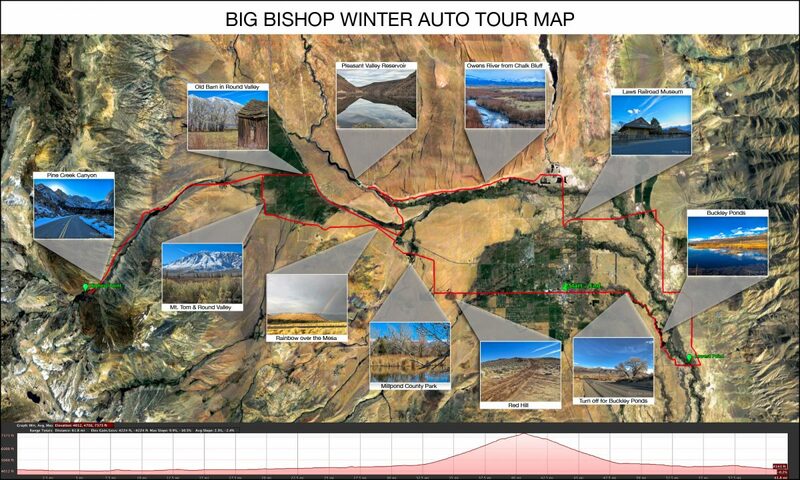 Find out more about this auto tour at the Bishop Visitor Center as you arrive in town. Ask for maps and directions. Now go get settled into your lodgings and get ready for dinner. If it’s a chilly winter day, dress in layers to keep warm and protected from the wind. If it’s a warm winter day – which could have had temps well into the 50s – be prepared for a significant temperature drop as the sun sets. Dress in layers for a relaxed, casual night out. 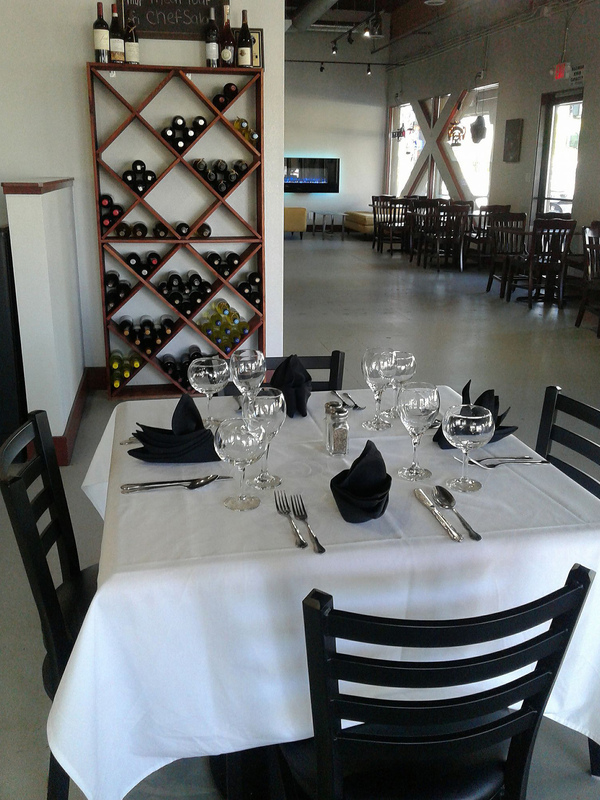 Perry’s Italian Café is proud to serve the finest old-world dishes in a modern setting. Traditional Italian dishes are made with quality, fresh ingredients and treasured family recipes. Thick Sicilian pan pizza is a specialty! The menu also offers some classic American dishes too. It’s a short 6-minute walk from your lodgings to Perry’s. Take some time to relax and unwind with cocktails at the bar, or have a seat in the lounge and watch a game on the large screen TV. 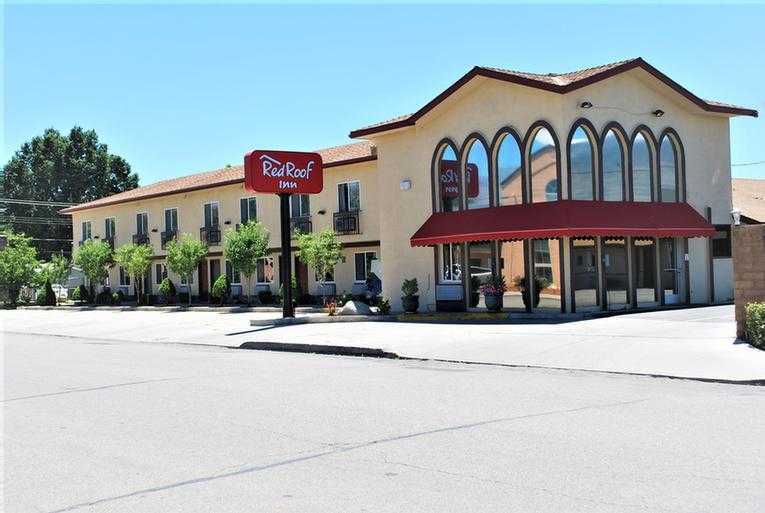 Centrally located the Red Roof Inn is an excellent stay at a reasonable price. The rooms are clean and spacious and the staff and friendly and helpful. Guests can enjoy a free continental breakfast and free coffee and tea all day. Plus, kids and pets stay free. One well-behaved pet per room is welcome. This inn has all you need for a good night to be ready for a great day out! The first 6 hours … you’ll still be asleep. Then we propose that you get going early to make the most of your morning in the mountains. The free continental breakfast is served from 6am – 9am. Eat up. Head out. GSC. UTV. ATV. OHV. GO! Winter in the foothills of the Sierra Nevada is a fantastic time for off-highway motoring. The dirt roads are sometimes slightly damp in winter and this reduces dust. 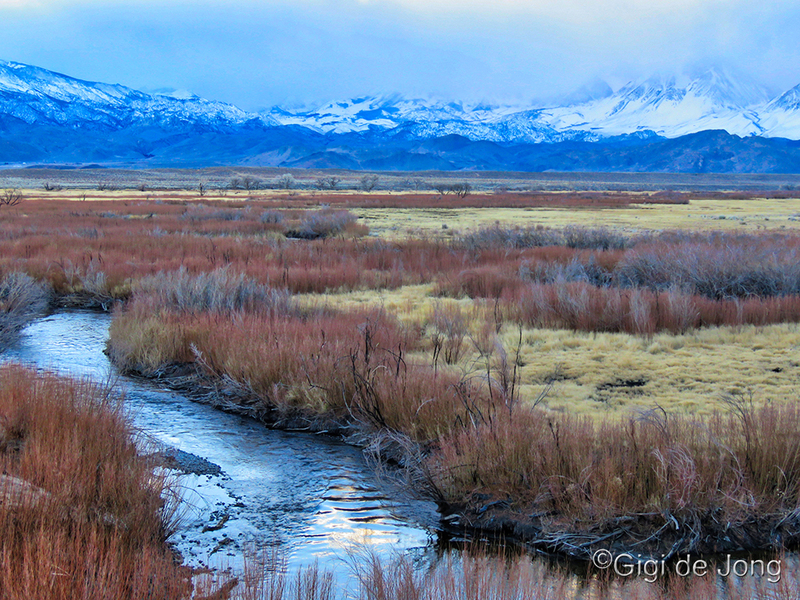 The rugged, rocky hills of the Owens Valley with the snow-covered crest of the Sierra Nevada in winter are like a picture postcard. Within a short distance from town, less than 8 miles along US Highway 168 West (West Line St.), you’ll reach the turn off for Buttermilk Rd. Here is a where a world of off-highway motoring opens up for even the most adventurous drivers and riders. There are miles of dirt roads and jeep tracks to explore. You’ll feel like you’re in another world – the natural world of wide-open spaces, snowy peaks, and babbling creeks. You may even see mule deer foraging for food in their winter habitat down here. Drive your own 4-wheel drive vehicle out here or rent a recreational off-highway vehicle (ROV) for the morning. These versatile and fun vehicles, the ATV (all-terrain vehicle) or side-by-side UTV (utility task vehicle), will give you greater access and more freedom to explore our big backyard. 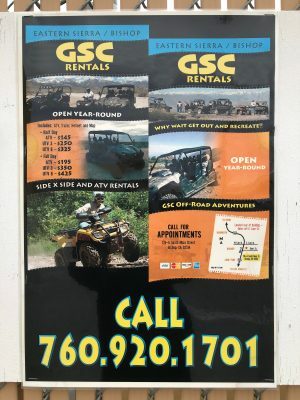 ROV rentals from GSC Off Road Adventures are reasonably priced and include the ATV, trailer, helmet and maps. You will need a tow hitch on your vehicle to tow the trailer and a bit of practice at home reversing a trailer is good preparation for this great Sierra adventure. Make sure to have helmets for every member of your party. Dress in layers – especially if you’re taking an ATV or UTV. And take plenty of water and some snacks. Hungry? Chilly? 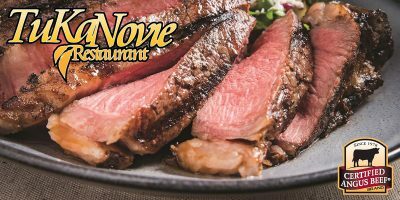 Warm up, fill up and enjoy a good meal at the Tu-Ka-Novie Restaurant in the Paiute Palace Casino. Sandwiches, salads, burgers, senior specials and a super kids’ menu offers great choices to satisfy everyone. And now… do you feel lucky? The Paiute Palace Casino is the Eastern Sierra’s only 24-hour Vegas style casino. There are over 300 machines to play slots or video poker and live table games – all for over 21’s. A small gamble might add a little ka-ching to your vacationing. Back in downtown Bishop the late afternoon sparkles in the warm winter sun. An easy stroll will stretch your legs and open your eyes to the good old-fashioned main street ambience of a small town. Most of the downtown stores are independently owned by Bishop locals. Stop in, peruse the goods, and chat with the friendly, knowledgeable staff. There are outdoor sporting goods stores, western wear, art supplies, books, crafts, and gifts stores. Pick up a memento of your visit, treat yourself to a little indulgence, or find the perfect gift for someone special. On buildings throughout Bishop the history of the Owens Valley is depicted on the exterior walls in the form of historically accurate and visually beautiful murals. As the sun begins to set, a walk around town is a wonderful way to learn a little of its history from the beautiful murals that tell of its past. 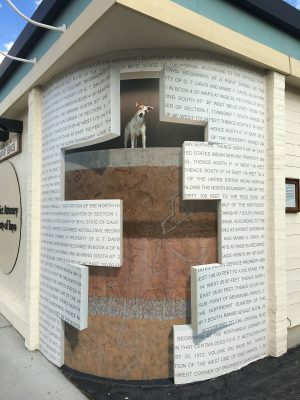 The Bishop Mural Society was established in 1997 “to display our heritage in a spectacular outdoor art gallery surrounded by natural beauty.” Today there are fifteen murals, the most recent of which is made up of 421 sculpted ceramic tiles and mosaic, created by 216 community members. The society is a founding member of the California Public Art and Mural Society and mural projects are ongoing through the generous support of the community. Download this Mural Map, or load this google map on your device, and check out the Bishop Mural Society’s webpage. This is a local’s favorite. Thai Thai Restaurant is located inside the Bishop Airport building. A 6-minute drive of 3 miles will take you out of the Bishop town limits and into the darkness of an Owens Valley night. 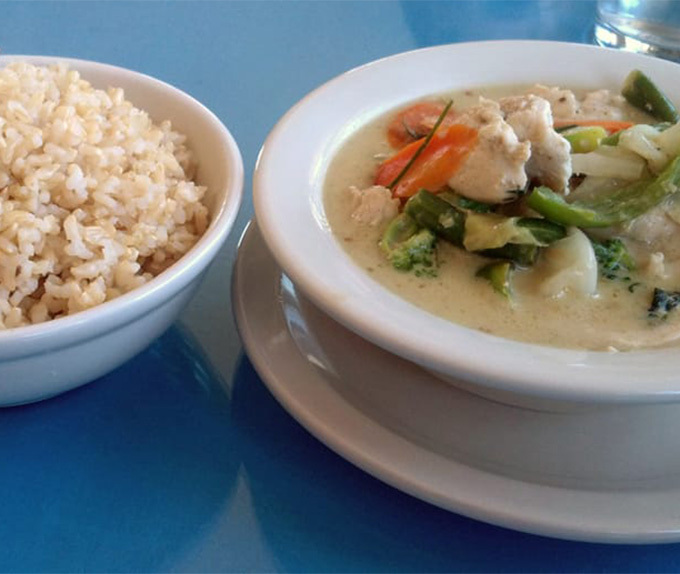 The soft glow of a low building beckons and here you continue your experience of “a world away from big city life.” It’s relaxed and convivial and the freshly prepared Thai food is delicious. Bring your own bottle of wine to enjoy with the meal. Dinner is usually an early activity in rural communities and Bishop is no different. The kitchen closes at 8 and we suggest getting in by 7:30 to enjoy a leisurely meal here. Note that Thai Thai is closed on Sundays and Mondays. It’s been long and adventurous day so perhaps the last 2 or 3 hours you’ll be snuggled in a warm bed at the Red Roof Inn. Continue sleeping for at least another 6 or 7 hours into the morning. Your 48 hours is almost up, but not quite yet! Open eyes. Yawn. Stretch. Up and at ‘em – only 5 more hours left for adventure. Get a hearty breakfast at El Ranchito. 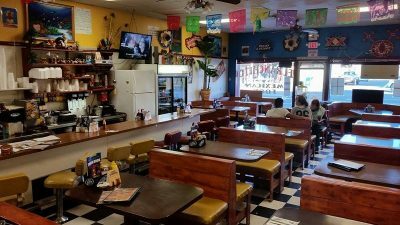 This diner-style Mexican restaurant is locally owned and operated. Opening at 7am daily, the breakfast menu, features breakfast burritos, enchiladas and omelettes, with gluten-free and vegan options. You’ll be fueled you up for one more auto tour and your drive home. Good news. Some of this tour includes locations along the highway on your way home. But first start with a few magnificent photo op hotspots in our big backyard. A big loop around Bishop will present views and scenes that will take your breath away. You may not get to all in one go-round. It all depends on how long you stop at each vista to look, point and shoot the shots that will be the memory album of your visit to this magical place. Here’s a route guide with points pinned along the way to stop and snap Instagram-worthy photos to share with family, friends and the world. Remember to include the hashtag #visitBishop so we can see our big backyard through your eyes. Click here to download a .gpx file for your GPS device. That’s it! But wait … there’s more. On your way home, about an hour out of Bishop, stop at these wonderful locations for a last look at our beautiful big backyard. 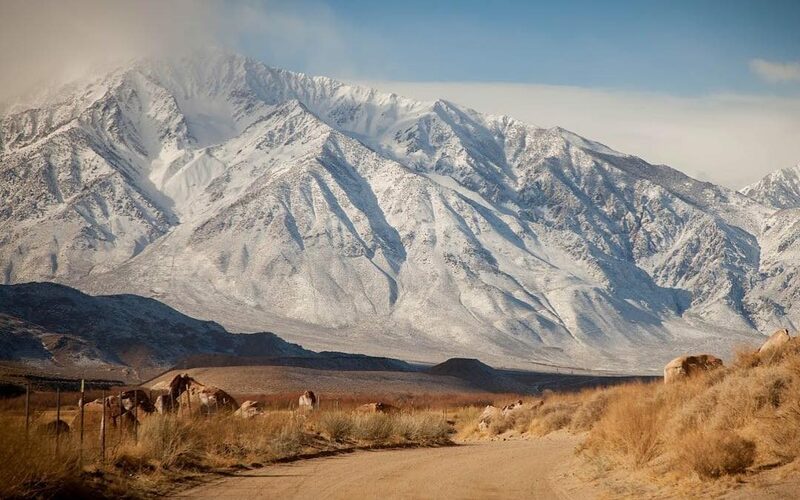 Going south: visit the Alabama Hills and snap the iconic pic of Mt. Whitney framed by the Mobius Arch. Going north: stop at the Mono Lake overlook and take pic of this incredible, expansive view. We’re pretty sure that this 48-hour tour itinerary will just whet your appetite for more. 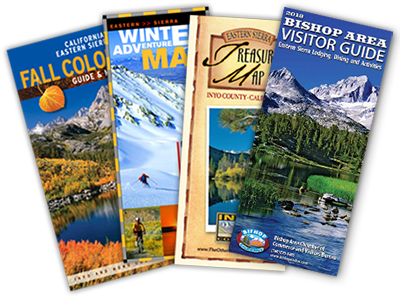 Stop in the Bishop Visitor Center on you way into and out of town and learn how much more there is to see and do. Get ideas from our knowledgeable, helpful staff. Take some maps to study at home. Then make some plans to come back.